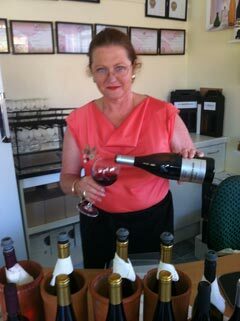 Known as the Red headed Goddess of wine; Susan runs the marketing and sales side of the vineyard. Leading a busy corporate life working under her maiden name of Susan Andrews, joining Mark in the vineyard was not on her agenda; however the romance of wine, sunny days and loads of hard work convinced her to try. Alongside these mundane jobs, Susan has developed extensive gardens; project managed the home-stay operation and generally falls into bed at night exhausted from her efforts. Visiting the cellar door you will find Susan in her element, educating the public about growing grapes, the vagaries of the different grapes grown on the site and her passion about Gewurztraminer, a wine which carries her name.